Motorists are being urged to stay alert on the roads as the low visibility weather, which was witnessed across the country on Sunday, is set to continue today. According to the National Centre of Meteorology (NCM), the weather will be fair to partly cloudy in general over the next few days and hazy at times. Speaking to Khaleej Times on Sunday, a spokesperson from NCM said light to moderate winds will continue to blow dust over exposed areas of the UAE. "From 10am to 4pm on Monday the wind will become accelerated with a southerly flow. 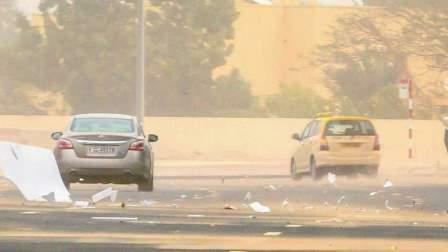 It may cause dust increase over exposed areas, which will in turn reduce visibility." Today, convective clouds will also form over the eastern mountains with a good chance of rain. "On Tuesday we can expect to witness a wind shift from a southerly direction to a north-westerly direction. In the western areas, temperatures will decrease to 3-4 degrees Celsius between 8am and 10am," he said. Today, visibility will remain low throughout the morning hours and early afternoon, but it will clear by Tuesday. However by Wednesday morning, the fog formation will reappear over coastal and internal areas, especially in the northern parts including Dubai, Sharjah and Ras Al Khaimah. Warmer days await the UAE, with the maximum temperature recorded on Sunday was 38.2 degree Celsius in Al Ruwais. On Monday, the maximum temperature recorded in Dubai will be between 34-36 degrees Celsius. On Tuesday, it will reach 31-32 degrees Celsius but on Wednesday it will drop to below 30.